Dalit leaders who took out a march were protesting against a line in the hoardings which they said was derogatory. MEERUT: A group of Dalits tore down hoardings put up for RSS mega convention Rashtrodyacalling the contents derogatory to the community. Dalitleaders who took out a march were protesting against a line in the hoardings which said “Just as the likes of Vashishtha, a Brahmin; Krishna, a Kshatriya; Harsh, a Vaishya and Tukaram, a shudra have increased the prestige and status of Hinduism, in a similar way untouchables like Valmiki, Chokhamela and Ravidas have increased the prestige of Hinduism”. About 20 of hoardings brought down after Dalits said the wordings were “derogatory and a means to show Dalits were inferior to upper castes”. Some of the hoardings about the congregation have featured Valmiki, Ravidas and 14th century poet Chokhamela. “Chokhamela, Ravidas and Valmiki are sacred to different communities of Dalits. How can anybody call them untouchable, that too in a public hoarding? 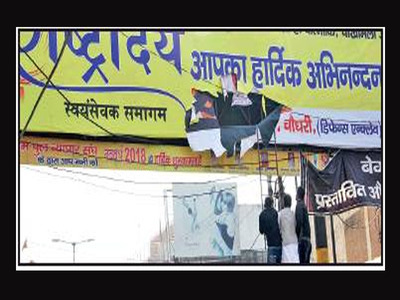 The sentiments of Dalits have been hurt and if these hoardings are not taken down with immediate effect, we will protest against the RSS event that is set to take place on February 25,” said Vipin Manothia, Dalit leader and UP state vice president of Bharatiya Safai Karamchaari Mahasangh. Dalit leaders stood atop a bus right below a hoarding and tore it up.